This new Mini Lean-to is ideal when space is at a premium, or where you have a spare wall. Fitting nicely against a wall, you'll be surprised how many plants you can get inside. Use one of our 3 Tier Stagings for maximum capacity - the wooden tops are removeable, so that you can grow tall plants such as tomatoes through the frame in the summer. You can add a Simplicity downpipe for rainwater collection and unlike some small lean-tos, each model has a roof vent included as standard. The bottom cill of the greenhouse has to lip over something slightly (traditionally this would be a brick base), but we also offer a convenient alternative option, a 4" high metal base. Click here to see the base prices for the Mini Lean-to. Please bear in mind that using this base will add 4" to the overall height of the greenhouse. You can erect without the metal base but you will need to sit the cill onto a small piece of wood such as a lath. You can choose from Horticultural Glass, or Large Pane Toughened Glass, in which case you also have the option of Bar Capping, which is used instead of the conventional glazing clips. 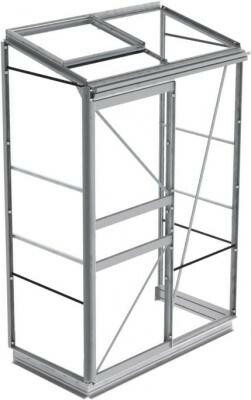 Bar Capping is supplied in White for a Silver frame, and in Green for a Green frame. See the Related Items section below.